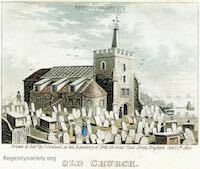 This website contains scanned images of Brighton & Hove engravings, including some title pages of C19th and C20th books on Brighton and maps of the town, dating from the 1760s to 1900. The overwhelming majority of these are scanned directly from originals held in private collections of members of the Society of Brighton Print Collectors. Occasionally they are scanned from secondary sources including newspapers and magazines published at the time the images were created. 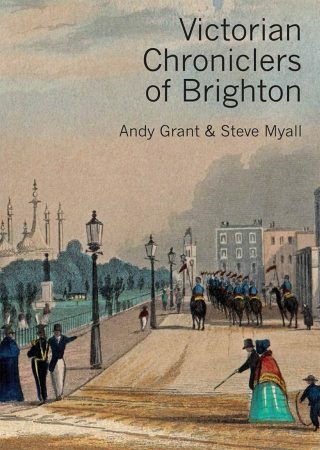 None are copied from Images of Brighton, which remains the most comprehensive source of information for those interested in Brighton prints. All of the images on this site appear to be the same size, but of course the originals are not. Some are large prints designed to hang framed on walls, whilst others are very small indeed. 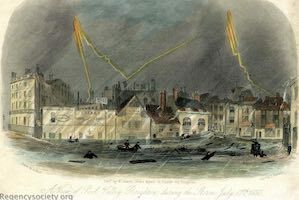 The two images below show, very approximately, the relative size of the originals of two images of the same scene: the storm of 17 July 1850 in Pool Valley. The image on the left, published by Grant, measures 11 x 18 cm, whereas the one on the right, published by Mason, measures 26 x 44 cm. Whilst the image on the left is considerably larger than the many very small images on the site, the contrast between the two illustrates this point. Whilst there is content to admire whatever the size, the particularly small images often show extraordinary skill by the original artist in creating considerable detail at very small scale. Where images fall into the ‘very small’ category, this is marked under the image number with ‘this is a very small original image’. The originals of all images in this category measure less than 9 cm x 11 cm (smaller than a modern postcard), and several are considerably smaller. 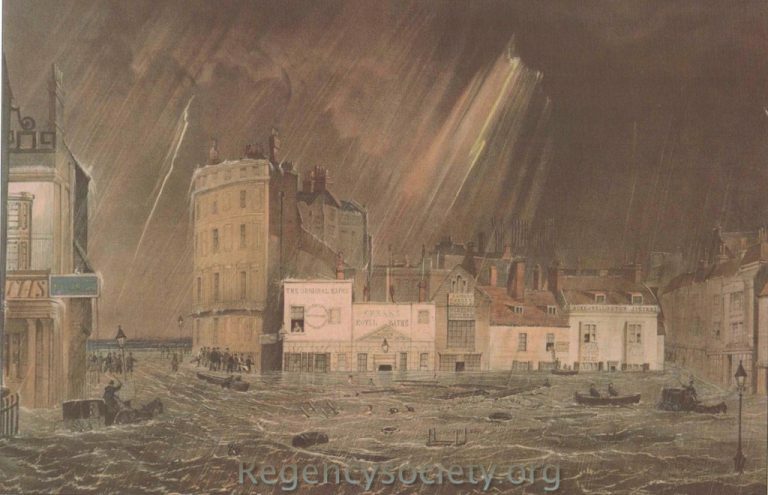 The site offers nearly 500 Georgian and Victorian images of Brighton & Hove. Several of these are sufficiently rare to be unrecorded in Images of Brighton and the site will be added to as and when the Society of Brighton Print Collectors finds other engravings. As the authors, the Society of Brighton Print Collectors gratefully acknowledges information from Images of Brighton, The Encyclopaedia of Brighton, by Tim Carder, East Sussex County Libraries, 1990 and A Pictorial History of Brighton by John Roles and David Beevers, Breedon Books Publishing Company, 1993. Other facts come from various Victorian and Edwardian books, guides and maps of Brighton. In addition to explaining the images, the accompanying text for these engravings shows where particular prints have already been illustrated in previous books on Brighton & Hove. 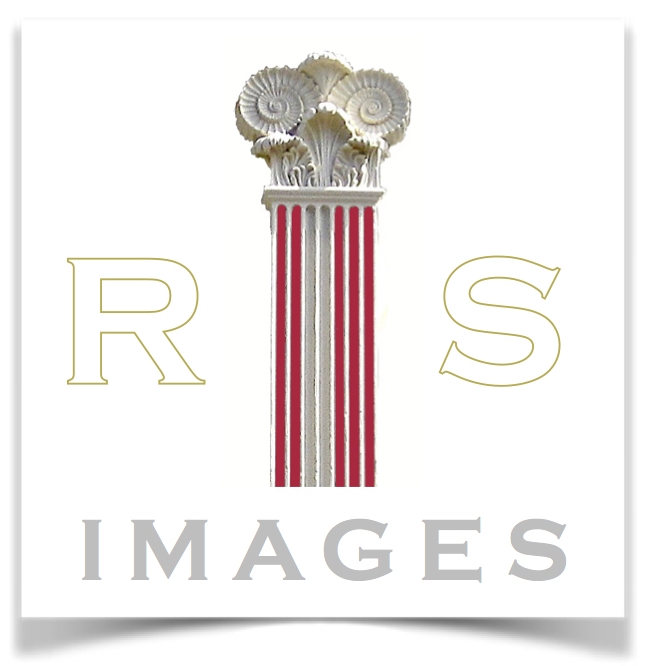 For future writers and authors we hope this will be helpful, with these text entries informing you which images have already been used (some many times) and in which books. By so doing this gives the option of several hundred prints of the town which have never been used as illustrations before.